If diamonds are a girl’s best friend, the least you can do is take good care of them. Here are a few tips on the “care and feeding” of your diamond solitaire – or other diamond jewelry – to keep it as bright and sparkly as the day he put it on your finger. Give a gentle weekly cleaning. You can find lots of suggestions on how to keep your rings clean, from toothpaste to special cleaning liquids. But the simplest option is to wash them in warm water with a few drops of mild dishwashing detergent then gently scrub with a baby toothbrush. 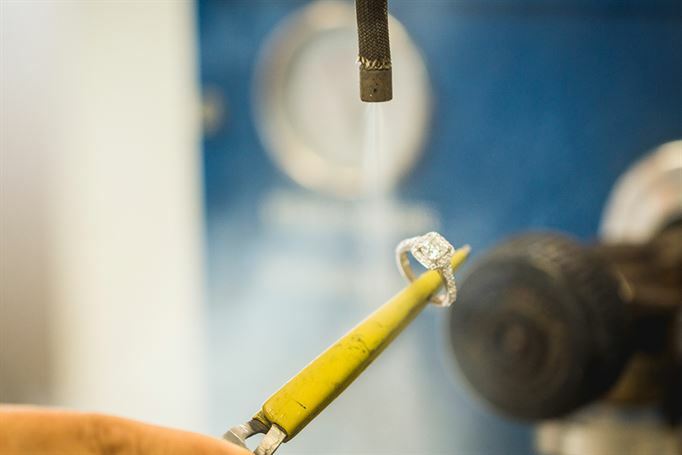 Another option – particularly effective for diamonds set in platinum – is to soak your jewelry in a mixture of 1/4 cup ammonia and one cup of warm water for about 20 minutes. Gently scrub them with a soft toothbrush, rinse them in warm water, and lay them out to dry. Protect it from harsh chemicals. You’d probably never consider exposing your diamonds to cleaning products, but don’t forget there are also chemicals in perfume, lotion, and sunscreen that can add residue to the ring and diamond, causing potential damage. Always remove your ring before applying these or any other products that may be made with harmful chemicals. Don’t touch the center stone. Diamonds and other precious stones are magnets for dust, dirt, and body oil. When you put on or take off your ring, grab the band on either side of the stone rather than grabbing the stone itself. Schedule routine cleaning and maintenance. Schedule maintenance appointments with your jeweler at least twice a year to make sure the prongs are tight, the diamond isn’t loose, and there are no hairline cracks in the shank. 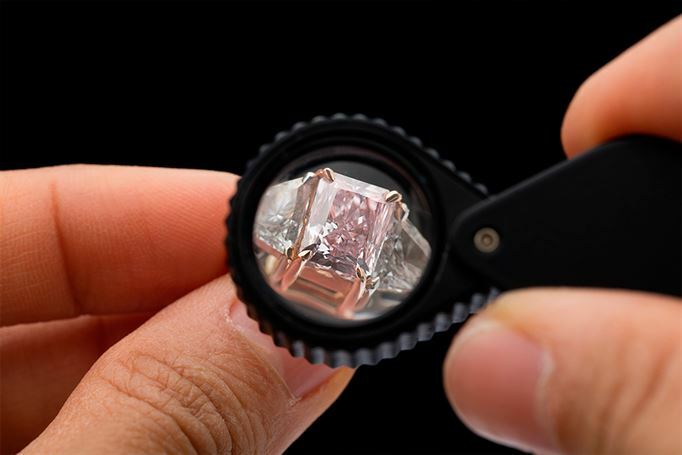 At Bromberg’s, we offer free cleaning services that include onsite steam-cleaning, and you can also ask to have it examined under magnification to make sure the prongs are secure and to check for diamond fractures or loose stones. Remember it’s not entirely indestructible. Diamonds themselves are incredibly hard, but that doesn’t mean they can’t chip. Take your rings off for any hand-heavy activities such as golf or tennis, gardening, or moving furniture. Remember, too, that the setting and other stones in your ring may be even more delicate than the diamond. If you wear it, keep it on. Don’t get in the habit of removing your rings each time you wash your hands, especially when you are away from home. The possible soap residue is nothing compared to the possible heartbreak of leaving your rings in a public restroom. Know your setting and treat it accordingly. If you have a 14K white gold setting, it may start to look a little warm with time and wear, but you can make it look brand new again by having your jeweler rhodium plate it. Because white gold can interact with chlorine and other chemicals, you’ll want to avoid wearing your rings in the pool, too. If your setting is platinum, store your jewelry in a box or chamois bag when you’re not wearing it to avoid scratches from other jewelry pieces. BONUS TIP: Make sure you have insurance coverage. It’s not uncommon for a diamond engagement ring to cost as much as used car, and it’s much easier to lose. The right coverage – either as a rider to a homeowner’s policy or a separate policy – can offer peace of mind and protection against loss, theft, or damage.